Home > News & Events > Happy Halloween! Litwin Lane Day Hab hosted a Pumpkin decorating contest the last week of October and all the entrants created very unique and creatively beautiful designs that made for a difficult decision by the judges! Using paints, felt and other craft supplies, pumpkins were turned into edible displays of food. Spiders made one pumpkin a scary thriller and owl, gumball machine and two witches showed up in the contest too. 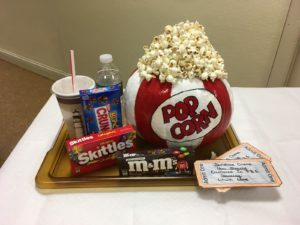 Visitors from administration and other SSV programs voted and the favorite design was the Movie Night pumpkin which included a nod to the agency’s Positive Behavior Supports system – which promotes and protects the rights of people served. Congratulations to all! Please Visit us on Facebook to view the rest of the creative pumpkins!